More than 500 endearing designs offered singly or in sets. These tasteful and exciting gifts are both practical and beautiful. Natural cork’s textured surface in warm shades of brown and tan is the attractive canvas for laser-engraved GrafixMat® coasters, practical and fun alternative to the same old selection of gifts and souvenirs. Forget coffee mugs and run of the mill key chains. An Earth-friendly coaster or set of cork coasters with a distinctive precision-lasered design is a unique decorative accent for home and office both useful and memorable. 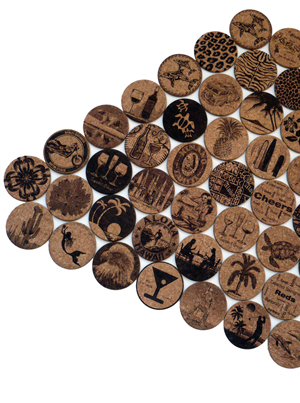 You’ll be captivated and amazed at the fine-line detail of laser-engraved designs on cork. Each graphic coaster features a story and a colorful illustration on the back side – adding entertainment and educational value to your gift. GrafixMat individual coasters and coaster sets are personal, practical, and always-welcome. Your coaster set designs can match or be mixed! Hand crafted by our staff artisans; made in U.S.A.
We offer high quality art and design that you can enjoy daily. Change your coasters each day and enjoy a variety of designs. You can purchase one coaster or buy 2, 3, 4 or as many as you wish, to create just the perfect coaster set. Coaster Caddies hold GrafixMat coasters and keep them organized and handy. Together, coasters and caddies create a lasting and functional gift.